I flipped through a few different cookbooks today trying to figure out what I wanted to try cooking for the blog today when I managed to stumble across a cookbook I had bought last year that I hadn't even opened yet. It was from Cuisine at Home again, this cookbook was called "Weeknight Menus". (They really should just put me on their payroll.) The first recipe on the list was "Chicken Parmesan". We have a winner! Amazing as it sounds, I don't think I've ever had chicken Parmesan before. I think it is one of those items that I just tend to skim over on restaurant menus while I look for the steak or fish. Even though I cook it often, I tend to associate chicken with boring. Here's hoping that this dish isn't lumped into that category! - Preheat oven to 450ºF. - Combine panko and Parmesan. 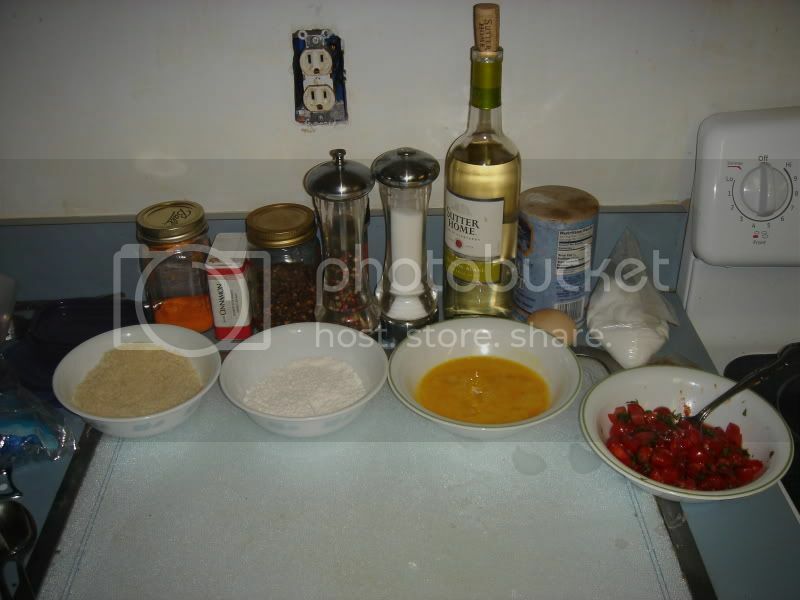 Place panko mixture, flour, and eggs separately in three shallow dishes. 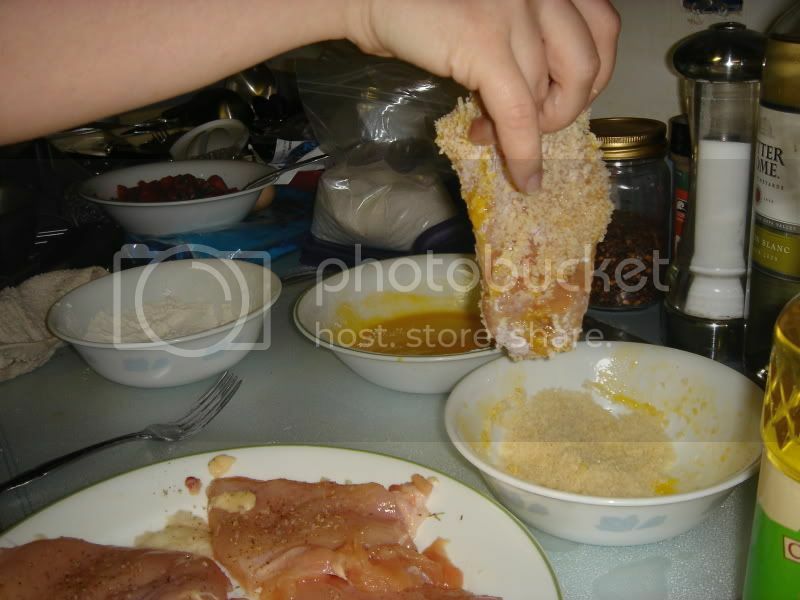 Cut each chicken breast in half; season with salt and pepper. 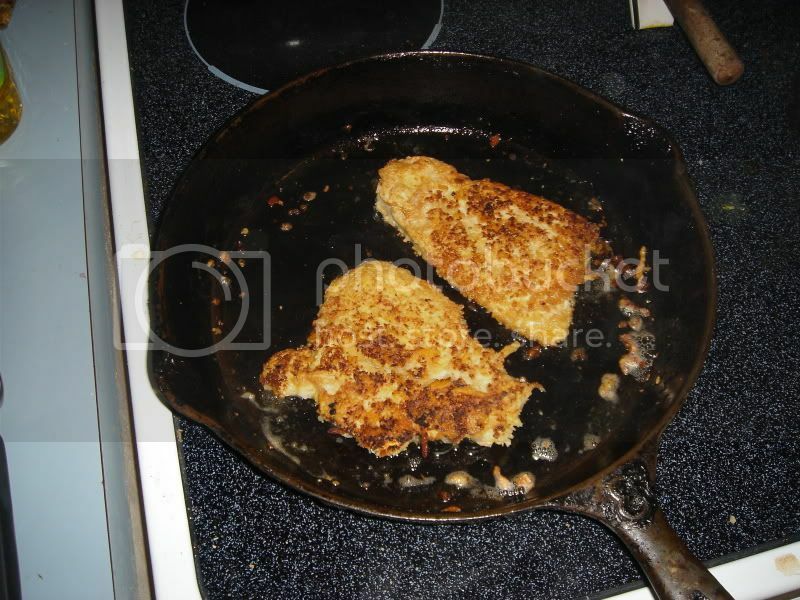 Dredge cutlets in flour, egg, and panko mixture. - Heat 2 Tbs. oil in a large saute pan over medium-high heat. Saute chicken, turning once, until golden, 2-3 minutes per side. 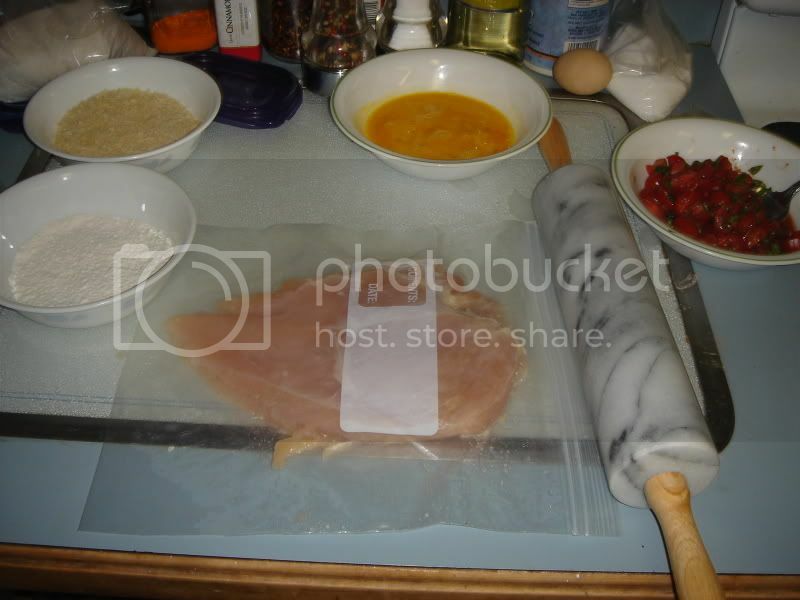 Remove cutlets to a baking sheet; top each with 1 Tbs. mozzarella. 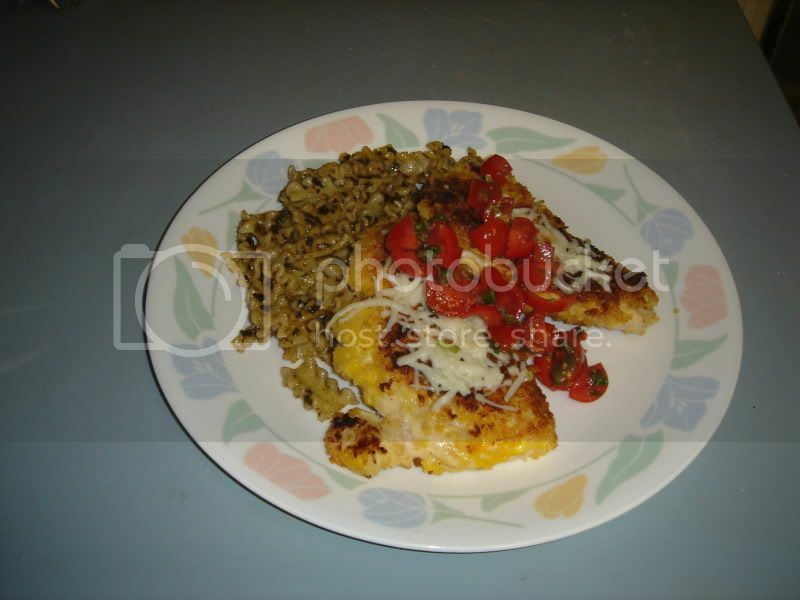 Cook cutlets in oven until cheese melts and chicken is cooked through, about 5 minutes. - Combine tomatoes, basil, capers, vinegar, tomato paste, and the remaining 1 Tbs. oil for relish in a bowl; season with salt and pepper. Serve chicken over pesto pasta, topped with the relish. - Cook pasta according to package diretions; drain. Toss together drained hot pasta, pesto, and lemon juice in a large bowl. Serve immediately. Another funny random thing I did: We have chickens and ducks that we raise. Not for eating (much to the disappointment to the men living in the house), but for eggs. So we always have random chicken eggs and duck eggs sitting around the counters. I grabbed what I thought was a chicken egg to crack, it turns out it was a duck egg. They don't taste any different, but the shells on duck eggs are much harder to crack. You know whereas you sneeze too hard and you break the chicken egg, the duck egg you have to hit with a hammer to break. Ok, not that funny but I was amused. Onward. Didn't work so well. Plus, it's a pretty awesome rolling pin and I didn't want to ruin it. Finally I found a cheap wooden meat pounder and that seemed to work semi-decently (after throwing all my weight into it smashing the chicken). I find it helpful when pounding chicken to put it into a ziplock bag. Don't close it, but that way it keeps from having raw chicken fly all over your kitchen (and yourself). The next part was pretty easy, just cut them in half then dredge and saute. My only issue was one of the chicken breasts didn't pound out so thinly, so it took longer to cook than the thinner ones. Also as a side note, remember to wash your hands thoroughly after handling raw chicken. I know this is something that is often beat into our heads, but it bears repeating often. Before I started to saute the chicken, I had put a pot of water on to boil for the pasta. I originally had intended to saute four chicken breasts at a time, but as you can see from the picture I could really only fit two in at a time. This, on top of the fact that I had a much thicker chicken breast to cook (which took longer) caused the pasta to be done way ahead of time. That's ok, just part of my learning curve still. I didn't change the recipe so much this time, but one thing that I did do was instead of using fresh mozzarella and grating it, I just bought a package of it pre-shredded from the store. For two reasons: Convenience and price. I'm too poor to be buying fresh mozzarella all the time. The final result! It tasted pretty good. If I make it again, I would make more of the tomato mixture since I thought it went awesome with the chicken and could have ate a lot more of it. The pesto pasta was really good as well. I didn't notice until I was typing the recipe for this blog that I completely forgot to put in the lemon juice for the pasta. My boyfriend will be happy about that. However, in my opinion the lemon juice would only have made it taste better. Personally only one piece of chicken was enough for me, so keep that in mind if you're going to make this recipe, since you'll be making a total of 8 pieces of chicken. Enjoy!